A Bexhill dad who died in a road traffic collision on the single-carriage A259 at Hooe was overtaking traffic while travelling ‘faster than 75mph’, an inquest has heard. Daniel Royal, 26, of Wineham Way, Bexhill, died on August 26, 2017, when he lost control of a BMW M3 on the A259 Marsh Road and collided with a motor home travelling in the same direction before skidding and flipping into a grass verge. An inquest into his death, held on Tuesday (October 9), heard how Mr Royal had been overtaking a number of vehicles while travelling west towards Pevensey from Bexhill. He joined a queue of cars behind a camper van travelling at approximately 40mph before carrying out his next phase of overtaking of four vehicles, including the camper van, according to witnesses of the collision. 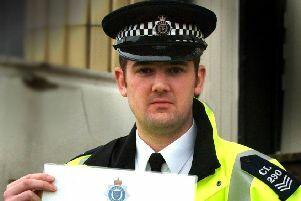 PC Andrew Slark, a forensic collision investigator with Sussex Police, said Mr Royal was in the eastbound carriageway overtaking vehicles when he was nearing a black Vauxhall Corsa – driven by Abigail Toft – which was directly behind the motor home. While Mr Royal’s car was still on the opposite side of the road overtaking vehicles, the Vauxhall Corsa started to move into the eastbound carriageway to overtake the motor home in front, according to PC Slark. He added: “There is physical evidence to suggest – shortly before the collision – Mr Royal steered his vehicle to the right, presumably to take evasive action as Ms Toft pulled into the eastbound lane. “Mr Royal then excessively and suddenly steered his vehicle to the left – causing an irretrievable loss of control – and collided with the driver’s side of the motor home. PC Slark said Mr Royal was not wearing a seatbelt at the time of the collision – which happened 875 metres west of the Lamb Inn – and suffered ‘fatal injuries’ as a result of being ejected from the passenger side window. Mr Royal was attended to by paramedics on the scene before being airlifted to Kings College Hospital, in London, where he was pronounced dead. PC Slark said he was ‘unable to determine’ whether the driver of the Vauxhall Corsa had looked in her rearview mirrors before moving to overtake the camper van. He said: “By conducting tests, I have been able to estimate that Mr Royal was travelling at 75mph. However, this does not take into consideration the collision with the motor home or with two trees in the verge. For that reason, my estimation is possibly underestimated and therefore the speed Mr Royal was travelling at was faster than 75mph. “In my opinion, the BMW was exceeding the speed limit for the road – 60mph. In her own testimony, Ms Toft said she had not seen Mr Royal’s car until she started to move out into the eastbound carriageway. PC Slark confirmed there was no damage or evidence to suggest Ms Toft’s Vauxhall Corsa was involved in the collision. Two people inside the motor home suffered serious but not life-threatening injuries, according to PC Slark. In the days following Mr Royal’s death, his mother Tara Heaphy, speaking on behalf of his family, paid tribute to a young man who had ‘the best character’ and was ‘always so, so happy’. She said: “He lived every day to the full and totally adored his fiancée Corinne and their three-year old son, Danny Junior. He could not have been more dedicated to them or to his family. “He leaves three brothers – Steve, 24, Dean, 21, and John James, known as JJ, aged five – and a sister, Leanne, 22. Senior coroner for East Sussex Alan Craze returned a conclusion of death by road traffic collision.